Tithe maps were created between 1836 and the 1850s following the Tithe Commutation Act which substituted a fixed monetary payment for the annual payments in kind which had dated from Mediaeval times. about 80% of the pre-1974 county. In some parts of the Lancashire the tithes had been commuted earlier as part of an enclosure award. They were drawn at a large scale and are accompanied by a schedule listing the owners and occupiers of the lands and buildings shown as numbered properties on the map and recording the apportionment of the payment. Quite often the description of the property includes field names which can provide significant information for the Lancashire Place Name Survey and is why the schedules are being indexed by LPNS volunteers. 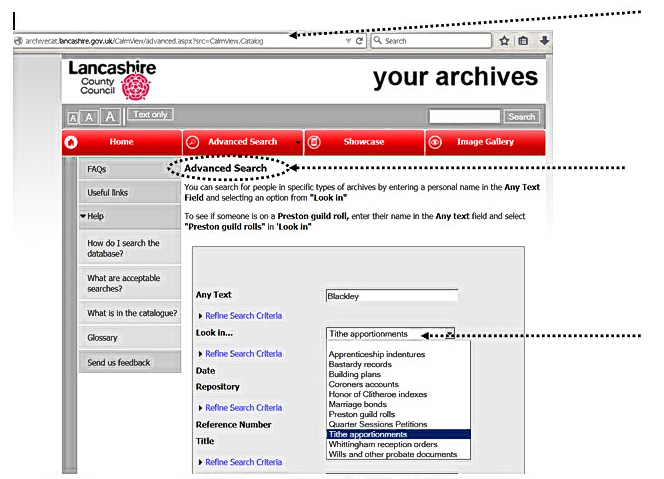 In Lancashire Archives all items have document references. Tithe records relating to Furness - now within Cumbria and in the diocese of Carlisle, are referenced DRC1/; those relating to Merseyside and South West Lancashire (in the diocese of Liverpool) DRL1/; those in East Lancashire and Greater Manchester (in the diocese of Manchester) DRM1/; whilst records relating to those Lancashire areas within the diocese of Blackburn are referenced DRB1/. None of the above appear on the modern OS map.